Phil’s spinal surgery hadn’t gone well. From a self-defined 70% of full painless function, he was down to about 30% after the operation. We spent an hour talking and I was struck by how much the poor quality of the interpersonal, relational care was at least as much of a disappointment as the failure of the operation to improve his symptoms. He reminded me of General Practice Professor, Kieran Sweeney who complained, in tears, that while the transactional aspects of his care with cancer was faultless, the relational aspects simply were not. Medicine is not solely a technical activity and pursuit, medicine is understanding and being with people at the edge of the human predicament. He goes on to make the distinction between being cared for and being cared about. Those caring for him were kind and competent, but those who cared about him, went beyond this to find out what really mattered to him. The link to the slides is here and the notes are below. Science has made such enormous strides and contributed so much to modern medicine that it is tempting think that medicine needs to be more scientific. Indeed there is evidence that doctors cannot interpret even the most basic statistics that are used to present the findings of most medical research and the lack of statistical literacy has been described as a large-scale ethical problem. On the other hand, there are those who think that modern medicine lacks humanity and doctors need more training in the arts and humanities. Being embedded in one camp or the other, there are those who believe that a doctor who becomes more of one will become less of the other, and most people if forced to choose between competence and kindness will err towards cold-hearted technical skill rather than compassionate ineptitude. 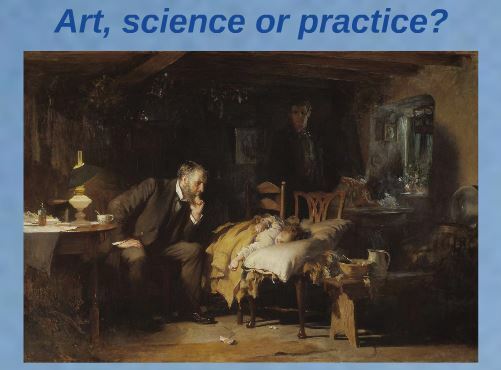 But they are not mutually exclusive and medicine is neither art nor science, but a practice, in which clinical judgement is not only knowledge of what could be done, but wisdom to decide what should be done. This practical wisdom, or phronesis, the skill to combine expertise and value, science and subjectivity is what makes doctors practitioners, rather than scientists or artists. Brain surgeon, Henry Marsh’s extraordinary book sets the scene at the beginning of many of the chapters: in a darkened room his trainees are looking up at the projected brain-scans of patients admitted overnight who are being considered for surgery. Eager to impress, they are often quick and confident as they identify the anatomy and the diagnosis and possible surgical interventions. On the question of what ought to be done, whether the risks of surgery or the likely prognosis warrants intervention they are far more reticent. He notes, more than once that, ‘few people outside medicine realise that what tortures doctors most is uncertainty’ a point also made by US surgeon/writer Atul Gawande in his book about care at the end of life. The modern pioneer of evidence-based-medicine (EBM) David Sackett, described EBM in 1996 as the integration of individual clinical expertise with the best available external evidence and the patient’s values and expectations. Without clinical expertise, practice risks becoming tyrannised by evidence, for even excellent external evidence may be inapplicable to or inappropriate for an individual patient. There may be more fundamental problems. Clinical expertise = external evidence + patient values? More importantly though, patient expertise and clinician values are excluded despite it being obvious, if under-appreciated that patients are experts and clinician values influence care. Greater attention to clinician values and patient expertise is almost certainly key to understanding variations in care. Clinical practice is the integration of the best evidence with the combined values and expertise of patients and clinicians. Taking into account values and expertise is no easy task, and has been the subject of many of my blogs, but the science itself is too often of dubious quality and reliability and most associations tend to be overstated. Clinical judgment is inescapably uncertain. The misinterpretation of statistics by public figures is a common source of educational material. President Eisenhower’s astonishment and alarm at discovering that half of all Americans have below average intelligence being a well known example. New York Mayor, Rudi Giuliani’s relief at being diagnosed with prostate cancer in the US where survival is twice that in the UK is a good example of how screening can effect survival rates. It is easily assumed that the earlier something is diagnosed the better, but there are reasons to be cautious. For one, it may not be possible to do anything to prevent the progression of the condition, so an early diagnosis may just increase the number of years that you’ve got to worry about it. For another, the natural progression of many conditions can be variable and difficult to predict. In these cases, erring on one side of caution results in more investigations and treatment which can do more harm than good, as in the case of breast cancer. A recent review concluded that lives were not being saved by screening adults with no symptoms. Choosing Wisely is one of many movements dedicated to helping doctors and patients make sense of screening and other medical interventions. 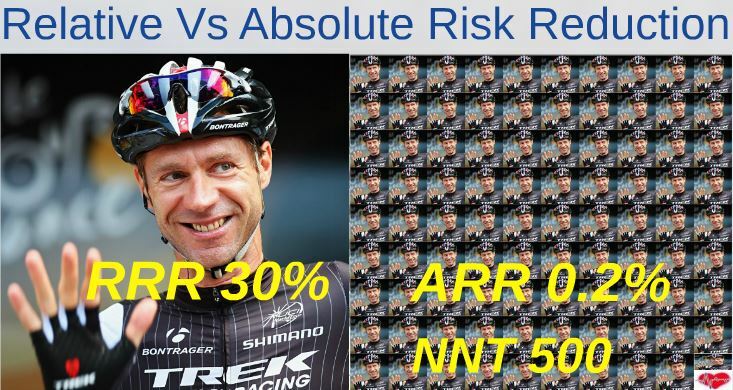 Relative and Absolute risk reduction. Statins, the drugs that reduce cholesterol levels are now the world’s most widely prescribed drugs, but most people taking them don’t know how much benefit they’re getting from them, or whether the benefits are likely to outweigh the risks. There are excellent online decision tools, here, here and here and many others. As statin can reduce your risk of heart attack or stroke by about 30%. This is the Relative Risk Reduction (RRR) and is the same for everybody. The Absolute Risk Reduction (ARR) depends on your personal risk of heart attack or stroke to begin with and so is specific to you. This is the one that matters. If you are at high risk, for example your parents had heart attacks, you have diabetes and high blood pressure, you’re overweight and smoke, then you’ll have a lot to gain – about a 30% ARR. But if you’re a fit 40 year old with none of those risk factors, you will have very little to gain, because your starting risk is so low, about 0.7%, and 30% of 0.7 is about a 0.2% ARR. In the slides I compare 50 year old smoker, Nigel Farage, with 43 year old, recently retired professional cyclist, Jens Voigt. The Numbers Needed to Treat (NNT) is a measure of how many people, like you (or Jens) will need treatment to prevent one heart attack or stroke. For Nigel it’s about 12 and for Jens it’s about 500. It’s worth considering that stopping smoking or eating nuts and olive oil every day would do Nigel more good than taking a statin and that either of them could have other risk or protective factors we don’t know about. Risk prediction is a very uncertain science. 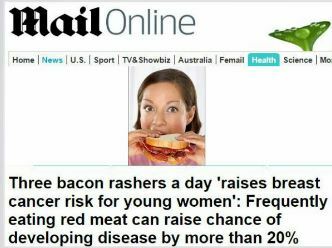 Newspapers, especially tabloids, make good use of relative-risk increase statistics, for example the Daily Mail: ‘3 rashers of bacon a day increases your risk of breast cancer by 20%’ headline. As with a risk reduction, a risk increase depends on what your risk of breast cancer is to begin with. Breast cancer is the most common cancer in the UK, affecting 1 in 8 (12.5%) of women. Fortunately almost 80% of women are still alive more than 10 years after diagnosis, but this doesn’t make it much less frightening. Assuming you are at average risk, a 20% increase on top of a 12.5% starting risk means an extra 2.5% risk, which equates to 2.5 cases of breast cancers over the lifetime of a hundred women who eat 3 slices of bacon every day for the rest of their lives. Professor of the public understanding of risk, David Spiegelhalter explains this in a video about bacon and bowel cancer. 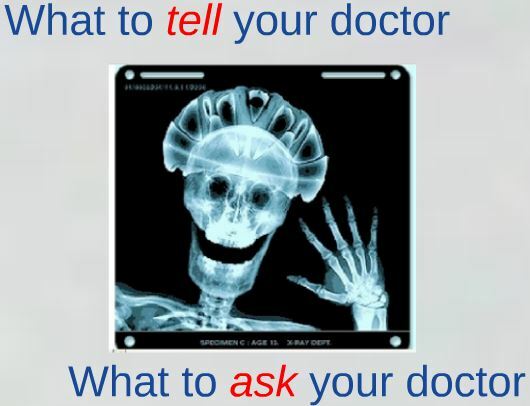 What to ask your doctor and what to tell your doctor. One thing that would be good for patients to ask their doctor before taking a statin (or any medication designed to prevent some future illness) is, ‘What’s my risk to start with?’ It may not be possible to put a figure on it, but its definitely worth bearing in mind that the higher your starting risk, the more you’ll have to gain from taking the drug and vice versa. It might help to ask, ‘how many people like me would need to be treated for one to benefit?’ There is a great explanation of numbers needed to treat (NNT) here. I would also ask about what are the risks of side effects of the treatment and the numbers needed to harm (NNH). What are you (not) willing to do? It may be tempting to skip the GP and go straight to a specialist, but the specialists’ diagnostic powers depend in part on the GP referring them only patients who have a significantly higher than average risk of disease. 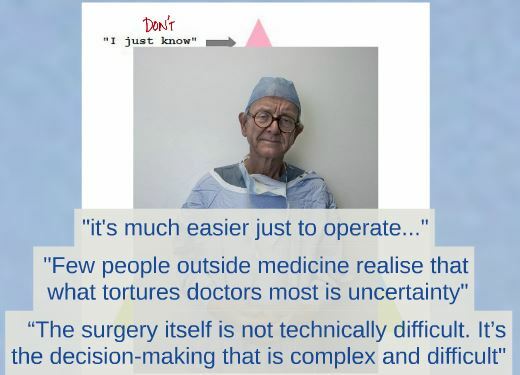 Brain surgeon Henry Marsh wrote that the experience he had gained by the end of his career made him much more cautious about who he operated on. Young specialists tend to be keen to intervene and tend to overestimate the value of their interventions. It’s tempting for patients and doctors, to skip this difficult, getting-to-know one-another phase and go straight for a scan or a referral, but without context and background information it can be extremely difficult to interpret results. For example, by the age of 50, 80% of people with no symptoms of back pain will have ‘disc-degeneration’ on an MRI scan. Once you’ve told the GP about your problem and they’ve examined you, they will often wait and see. When Voltaire said that ‘the art of medicine consists of amusing the patient while nature cures the disease’ he was, for most conditions absolutely right. The most articulate of GPs, Iona Heath has described what we do as The Art of Doing Nothing. But doing nothing may require great strength to bear witness and support patients during terrible suffering, or very serious and careful listening. A good doctor will tell you how long your symptoms should last and make sure you’re seen again promptly if they don’t resolve in the expected time. By now the probability that you’re suffering from something more serious might have increased from 1 in a thousand to one in a hundred or even less. This excellent paper shows you how much time contributes to diagnostic accuracy in general practice and this online tool shows how changing the likelihood that a patient has a condition, radically improves the reliability of medical tests. Good doctors make it up as they go along. In the 18th century, Thomas Bayes developed a simple mathematical formula to show how adjusting prior probabilities affected future predictions. Doctors, who do this all the time, have been described as natural Bayesians. The history contributes up to 90% of a diagnosis and most of the remainder is contributed by physical examination and simple tests. Every question in a medical history and every sign in a physical examination changess the prior probability of a particular diagnosis. 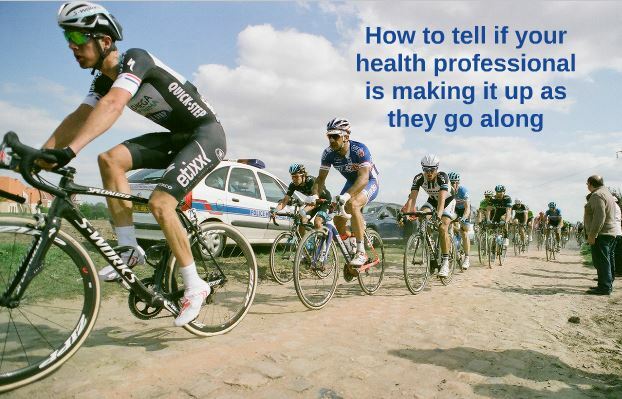 Like the cyclists in the presentation, who have prepared as well as they possibly can, but need to be constantly vigilant of changes along the way, doctors are continually reappraising their patients, open to new information and changing circumstances. 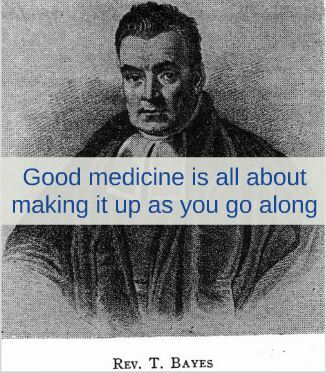 Good doctors are partners with their patients, sharing information in ways that they both understand, discussing values, risks and uncertainty and creating narratives that make sense to them both … making it up, as they go along. Very interesting fros) m this patient’s point of view. Reminded me when I had polio in the 50s, my brilliant surgeon JIP James (went on to be President of various colleges ect) went around Wards each week with his team, discussing our care around our bed. If brave enough, we joined in, and thanks to working together, having been told I would never walk again, I walked out of Stanmore. When I had cancer, things had moved on a something called a MDT took place of consultations around the bed. I soon realised that what was written in my notes, and reality, were two different things. It’s no longer personal touch, but mediine at a distance – not so good for patient. This is a really well written piece that encompasses a lot of the views and ethos of myself and other authors here on the FOAM4GP blog. Highly recommended reading to any Registrars or those wondering about their role in all of this GP malarky!